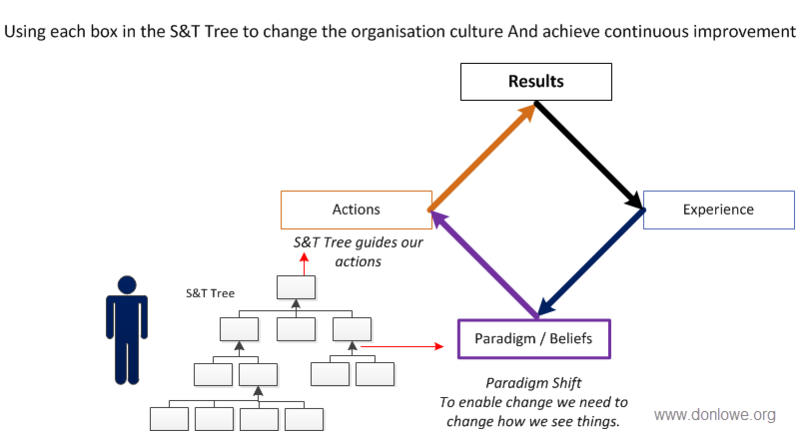 In this article we will look at behaviour and cultural change in the context of an organisation embarking on a business improvement initiative. The change in behaviour and culture can be achieved as part of the business improvement process. Have a quick look at the article on successful organisations, as behaviour and culture are a critical success factor for such organisations. A key factor to achieving change is the people involved. Using Stephen Covey’s maturity continuum we will classify people as having three levels of maturity from (L1) dependence to (L2) independence to (L3) interdependence (team player). Dependent people need constant attention and direction. Dependent people are generally re-active in nature. They may not take responsibility for their actions or lack of actions. Independent people will be pro-active and take responsibility for what they must do and can be relied on to complete work once they have accepted responsibility for carrying out the work. Team players have all the good qualities of independent people. In addition they will go the extra mile to achieve the teams’ goal. A truly interdependent person will respect the roles and responsibilities of others in the team. Understanding which category each of the people involved fits into, is critically important for the success of the change initiative. It will enable those implementing the change to tailor how they influence the behaviour of each individual. Another important factor in changing behaviour and an organisations culture is that it takes considerable effort and time. In this article you will see a couple of useful methods to ensure that your effort and time are used to good effect. What we do and how we behave are based on habits that have evolved and become embedded over time. People adopt behavioural patterns that enable them to survive within the environment they choose to be in. This choice is either made consciously and pro-actively or by simply allowing circumstance to choose for them. How do we cause change in behaviour and organisational culture? Changing our behaviour can be very difficult, because habits are embedded and part of how we are. This is a challenge when a person realises they need to change. It can be exceptionally difficult when involving people who see no need to change. The methods described here will make you task of showing individuals why change needs to happen. First by agreeing on where you want to get to, then agreeing on the steps on how to get there. To change our habits and behaviours we need to change the way we think and the way we see the world around us. We see the world based on our experiences, our experiences are the consequences of actions taken by those around us and ourselves. Our actions are based on how we see the world. To change we need to have an intervention somewhere in this cycle. To break the cycle it is useful to create a vision of the future that everyone in the organisation can sign up to. Then ensure the most suitable actions are taken to achieve the vision. As each action delivers a result, the result will give an experience. Based on the experience you will influence the way each individual sees the world around them. 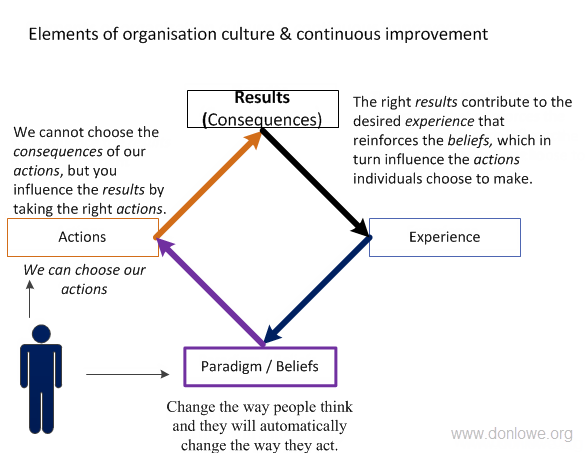 By initiating the right actions the chain of events will lead to a change in behaviour and culture. Define what the vision for the organisations future will be. Eliyahu Goldratt and his team at the Goldratt institute came up with a simple yet extremely effective way of visualising an organisations vision. 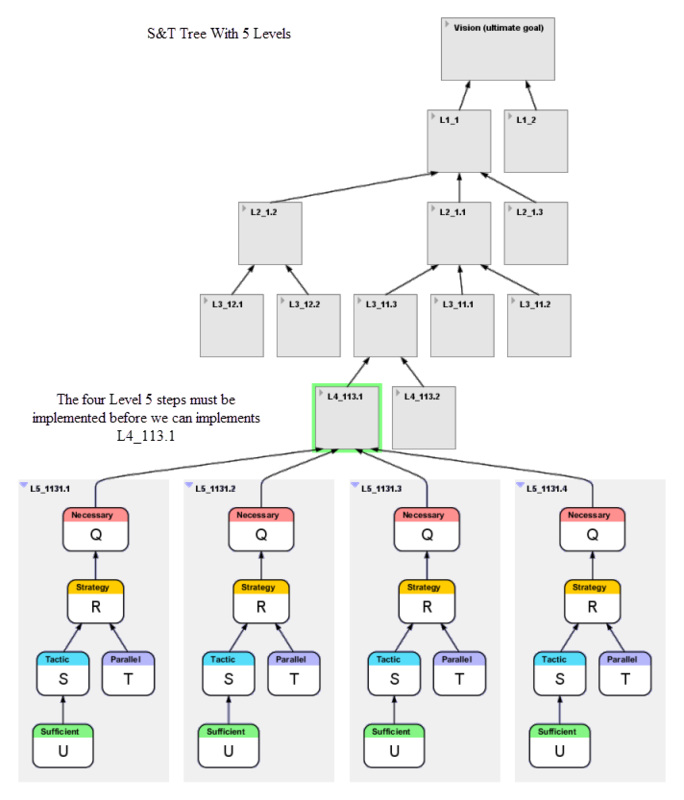 The tool used to do this, is called the Intermediate Objectives Map or IO Map. 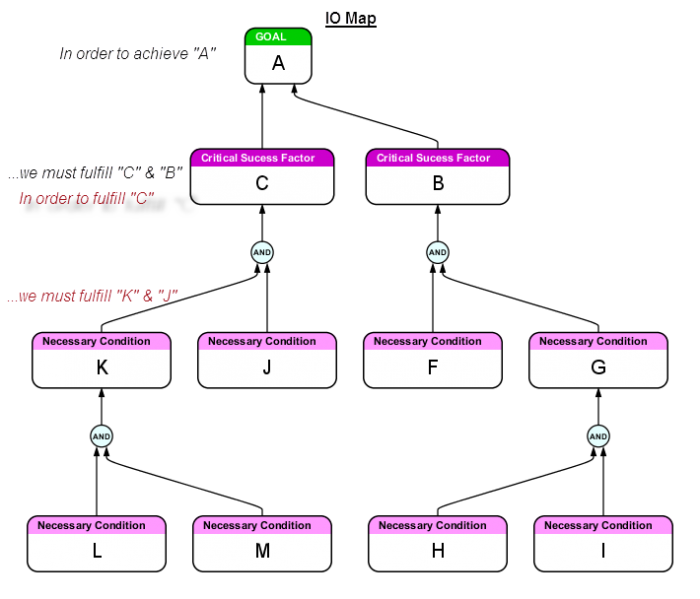 Use this tool to show the organisations Goal along with the conditions that need to be fulfilled in order to achieve the Goal. Once you have an agreed Goal and what conditions need to be fulfilled in order to achieve the goal, you can work out what actions need to be taken in order to fulfil the necessary conditions for achieving the goal. By defining what needs to be done before actually carrying out any of the steps, people can get a clear understanding of what is going to happen and in what sequence, therefore they will be more empowered and in control of their situation. Start by implementing each step (Action) in the Strategy & Tactics tree from the bottom working upwards. Use each step as a learning process. Identify what worked, including how people behaved in relation to the actions taken. Then move onto the next step and repeat the process. By this process you will gradually influence the participants, building up the right behaviour and culture.